No new garment posts this week: I've come down with a cold and could neither photograph the one thing I have completed nor finish the other thing that I have started. 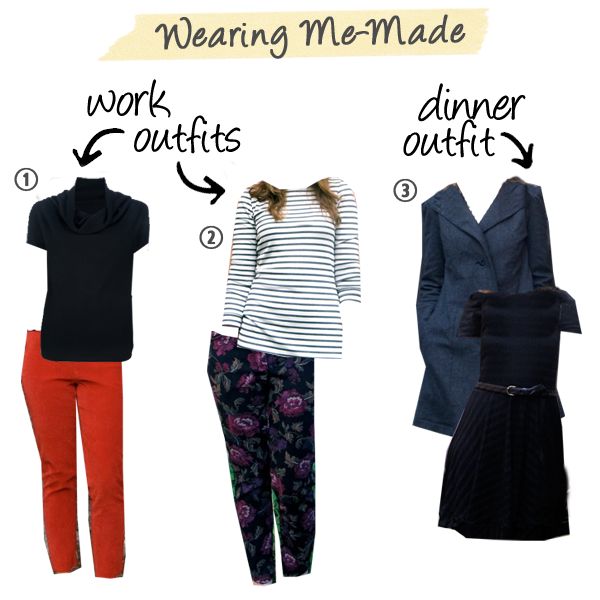 I am happy to report, however, that the three non-pajama outfits that I did wear this week were very me-made! I still have many things I'd like to make along my way to building my 'work' and 'fun' wardrobes, but I also get very excited whenever I realize that what I've chosen for the day is something I've made myself. I think it also helps to document it here so I can see what works for me! I'm excited for me-made May too! It's getting to the point where I wear a me-made most days now without thinking twice about it, which is pretty cool. Hope you feel better soon!